Becoming better naturalists as we study the variety of trees and life living amongst General Sherman and his Giant Forest. Long before the sun completely sets, trees the size of many whales cast their shadows dark over smaller pines and the occasional oak. They feel like particle board, a horrible comparison but true nonetheless, and glow brilliant red-orange around the darker skinned fellows they share these Sierras with. 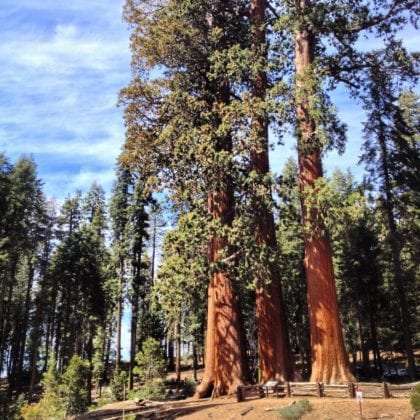 They are the Giant Sequoias and they have been towering over these beautiful mountains for millennia. The Lady finds two growing close enough to reach her hands out, momentarily allowing each of the big trees’ energy to flow through her and into the other. Patches of snow linger. Wildflowers, purple and yellow, begin to shine through. What most people consider summer is already present, particularly in the lower elevations of the Buckeyes and Sycamores, where mid day’s heat reddens our winter white skin. My boys, becoming quite the budding naturalists, forage among the underbrush for cones, inquiring what types they are. The awe in three year old Winter’s eyes at how a small cone could produce seeds that will one day grow into skyscrapers is like a birthday wish. Tristan, the oldest, searches high and wide for rarer trees like Jeffrey pine. I have a running contest, if he can find and identify new species of trees before I do, he earns himself a six pack of root beer (soda being a rarity around here). There’s an irony to rewarding him with sugar water for his pursuits in all things opposite of that, but I don’t mind. Seeing him interested in something that doesn’t involve a screen thrills me. And he’s yet to beat me to any one new find. My Lady has never looked more beautiful to me than among these canyons, these big conifers. Later in the night, a campfire glows to Van Morrison. Stars set up their connect the dots nightly procession across the sky, and we take in the dark, the silence, the warmth of burning oak. We’ve decided to stay here longer. Everyone is in love with the lush of it all, and though I long for the desert, this is one of those relatively unpopulated places of beauty deserving more time than we’ll likely spend. It’s when you hate to leave that you know a place is truly spectacular. The idea that whatever comes next will have very large boots to fill. Giant Sequoia sized boots.